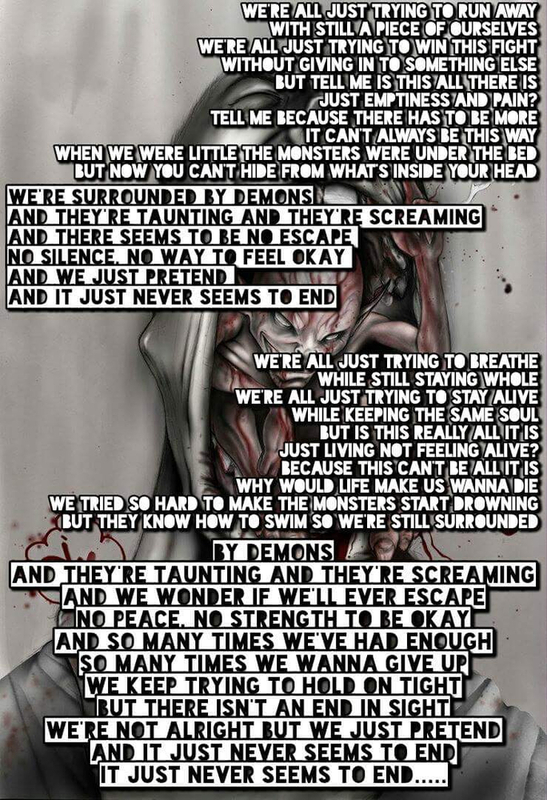 I've been writing lyrics since I was 12 but honestly, they only started being slightly good when I was like 17. I now have over 1,300 songs. I'm looking to start a pop-punk/alternative/rock band. I'm also looking for maybe another lead singer. Someone who can not only sing but also help me with my vocals. The second vocalist can play guitar or bass or nothing else. Sort of like how the band Hot Milk has 2 vocalists. I have some photos uploaded that each feature partial lyrics of mine to a song I wrote. I always thought All Mad Here would be a good band name (metaphorically, it'd be saying we're all different but we're not alone, and at live shows we can say stuff like, "We are All Mad Here!" lol) but if you have ideas for band names, I'd love to hear them. I should probably mention I have the same chest condition, Pectus Excavatum, as Parker Cannon of The Story So Far. Google pictures and videos of him performing to get a better understanding. He sometimes does shows with no shirt on. As you can see he tends to take a breath often or something. I sometimes have a hard time breathing or I get out of breath easily. I've had a metal bar in my chest for many months after a surgery back in October 2017 where they split my ribs in half. It was taken out in June 2018 but I probably still won't have the same breathing as someone who never had the condition. I write about a lot of things but mostly depression/anxiety and physical pain from health issues or surgeries. I think those are my best but I also write about love, family and hatred. Angry hate songs are my probably the most fun to write. I listen to almost everything but I mostly love pop-punk and alternative type stuff.